Wingback chairs are distinguished by the side panels or "wings" on the back, which originally served the purpose of shielding from drafts in a room, or excessive heat from the fireplaces. Today, the wings provide a comfortable surface to rest the head for taking naps. 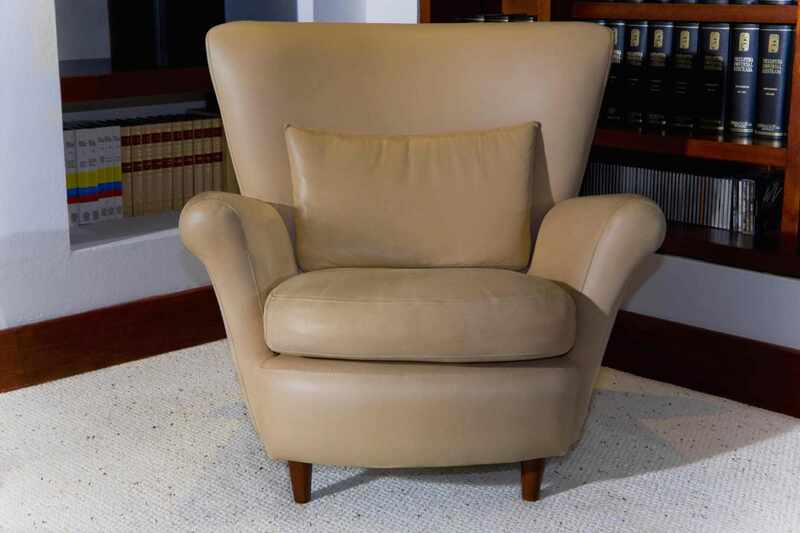 A wing chair is perfect for lounging or reading. An occasional chair is just that, a chair that is used occasionally. It is usually an extra chair that is used when you have guests over. Occasional chairs often end up being accent pieces in a room, selected for their decorative value more than anything else. A club chair is a cushy, upholstered chair with arms. It has arms and a low back and is usually upholstered in leather. The term comes from 19th century England where gentlemen's clubs that had this type of chairs for relaxing. Like many other traditional styles, this one has been updated, too. While leather is usually the covering of choice, now club chairs come in fabric, too. Typically, dining room chairs are side chairs. A side chair is a small chair with a frame that is not upholstered. It has a solid frame and it may or may not have arms. The seat and back may or may not be upholstered. Besides use in the dining room, side chairs may add extra seating in a living room or other spaces. They are not bulky like club chairs. A slipper chair is an armless upholstered chair with short legs that let it sits closer to the ground. It is its low height that distinguishes it, and also makes it a comfortable choice for many. While originally slipper chairs were used in ladies' bedrooms for sitting, or to help when getting dressed, they can be found in any room in today's modern home. A reclining chair is popular for reading and watching media. You can find traditional and stylish versions in leather or fabric. A recliner lets you put your feet up and relax, then stow the footrest when you're done. A chaise is essentially a long chair, one on which you can stretch your legs without having to use an ottoman. The back is usually at a semi-reclining angle, and this is the chair you use for relaxing. A chair and a half is a very useful piece of furniture, being slightly larger than a chair and smaller than a loveseat. The width of a chair and half makes it an ideal piece of furniture for lounging. The chair featured here is modern in style, but you can find one in any style. It may have a tight back and a tight seat, or have loose cushions for the back and seat. It could also have a tight back with a loose seat. The graceful curves of a klismos chair have assured its popularity throughout the history of furniture. The klismos chairs were first used by Greeks, but the form has been reinterpreted over the centuries. For use in today's modern interiors and exteriors, you will find klismos chairs in a variety of materials and coverings including metal, wood, and leather.